DeMint, hoisted by his own petard. Sen. Jim DeMint (R-S.C.) called Democrats' push to force through an arms control treaty and an omnibus spending bill right before Christmas 'sacrilegious,' and warned he'd draw the process out to wage his objections. 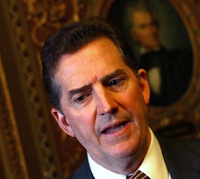 FP's quips in response to DeMint's comments are spot-on and chuckle-worthy. If anything, it seems to me DeMint has run more afoul of his own Christian values than the Democrats he's calling sacrilegious. What he's doing here sounds a lot like the behavior he's enjoined against by the Commandment regarding taking the Lord's name in vain.